The Easy Jaw™ System allows you to change from one set of jaws to the next in about 30 seconds. The patent-pending Snap-Lock Technology uses no jaw screws or wrenches to exchange jaws; simply use the supplied jaw key to depress a keeper latch in the jaw and slide each jaw right out. You then slide in the next jaw type until you hear the "snap." 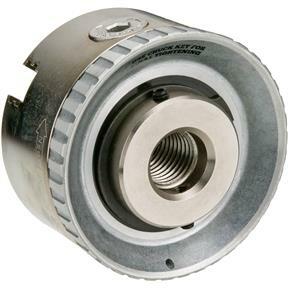 This gets you back to turning quickly with the jaws you need to hang on to your project safely. 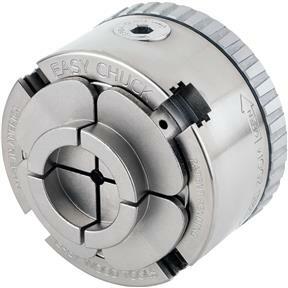 The Easy Chuck's Zoom Ring™ also gives you the ability to open and close the chuck very quickly for various gripping diameters with just your fingertips. 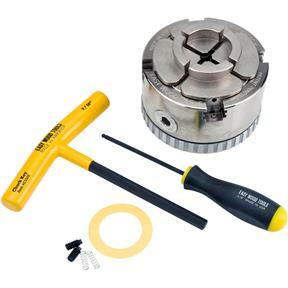 Use the Zoom Ring™ to bring the jaws into position to lightly grab your project, then use the chuck key for final tightening. Shipping was quick and the product is exactly what I expected.